This quality bra provides good solid support and is ideal for the larger bust, especially for harder efforts. It has a fast-drying baselayer which keeps you cool while the sweat-wicking fabric keeps you dry. The adjustable straps and open back make it easy to take on and off. It’s nicely shaped and sizing is true to fit. Currently available in black and turquoise. Whether you’ve just run your first few steps, or you’re planning your next ultramarathon, Women’s Running is your virtual coach: here to offer inspiration, advice and support, whatever your journey. We have reviews of all the latest kit, including support shoes and sports bras, as well as your essential leg workout to help you run stronger than ever. 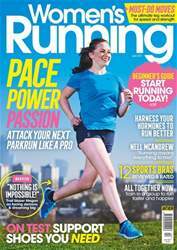 We’ve got interviews with intrepid London Marathon runners, including Nell McAndrew, as well as with our cover star, Megan, who is the first hearing impaired person to run from John O’Groats to Land’s End. That’s a thousand miles, all told! And this month, we’ve explored the world of hormones, from puberty to menopause and everything in-between, and how we can work with them to run our very best. Does kinesiology tape really help fix your niggles?